Cavities In Milk TEETH Affect Permanent TEETH ? Does Cavities In Milk Teeth Affect Permanent Teeth? Cavities in milk teeth are not the single governing factor leading to compromised health of permanent teeth. That is caused by multiple reasons. Poor oral hygiene and diet are the most common ones. Here about the Cavities in milk teeth affect permanent teeth. Cavities that are left untreated for a long time, it leads to an infection that can affect the underlying permanent teeth. Small cavities need small fillings, big cavities need big fillings. Cavities close to the nerve of the baby tooth should be evaluated for half or complete root canal treatments. The whole point of these treatments is to arrest the progressing decay, restore baby tooth and maintain an infection-free environment for the permanent teeth to develop. If the baby tooth decay spreads to the adjacent teeth (in a mixed dentition — both baby and permanent teeth being present), the permanent teeth will decay as well. Remember tooth decay is a bacteria and it caused infection and it spreads through the oral cavity. Where there is a lack of treatment of decayed primary teeth, bacteria continue to progress deeper into and through the root canals into the underlying bone. This may cause acidic environment around the developing permanent tooth, the response to which is related to the age of the child and status of development of the erupting permanent tooth. Child’s permanent teeth start to come in around the age of 6. Do you know how to protect them from cavities? Daily brushing and flossing and dental check-ups every six months are the foundation of good oral hygiene for kids, but there is more than you can do to prevent tooth decay. You have probably been brushing your child’s teeth with a fluoride toothpaste. This natural mineral offers great cavity protection. It hardens tooth enamel, protect teeth from tooth decay. If your drinking water is not fluoridated, your dentist also recommended giving your child fluoride water. Before those permanent teeth even emerge this mineral can accumulate in developing teeth, strengthening the enamel before they break through the gum line. To help protect your child’s adult teeth, ask your dentist if your child is getting enough fluoride. Depending on his risk for tooth decay, your dentist may suggest adding this mineral through drops or other supplements. 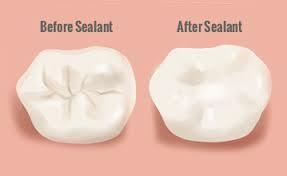 Another way to prevent permanent teeth from cavities in milk teeth is with dental sealants. 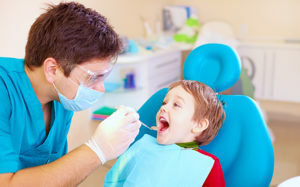 As an in-office procedure, your dentist can apply a thin plastic coating over the chewing surfaces of your child’s adult back teeth, the molars and premolars. The coating helps to seal these teeth, protecting from tooth decay. Talk to your dentist about this option at your child’s next appointment. What your child eats does matter tremendously. 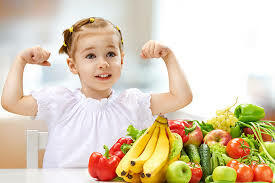 According to the American Dental Association, food choices can affect how tooth decay in children develops. The primary culprit of tooth decay is sugar. Sugar is not only found in sweet treats, but also healthy foods like milk and fruit. When bacteria mixes with sugar in the mouth an acid forms that attack teeth for about 20 minutes. So your child doing these tricks well, no milk teeth cavities formed.